Best Corn Dish So Far | I Am Not A Restaurant! So, I spend my knife skills cutting corn from the cob. And though it's not as good this time of year as in late August, global sourcing means year round corn availability. This dish will cover long travelled corn's shortfalls…with BACON! Crisp bacon, mostly drain the fat (or not – I didn't) and cook onion 3-4 minutes. Add bell pepper and cook veg until a bit softened, 3-ish minutes. Add corn. Cook 2-3 minutes, longer if using frozen corn. Add scallions & bacon. Stir, season & serve. Add-ons: 1 chopped jalapeño (add w bell pepper) or pinch of cayenne. A dash of cream – add off the heat at the end, give a stir. And/or sprinkle of your fave melt able cheese. 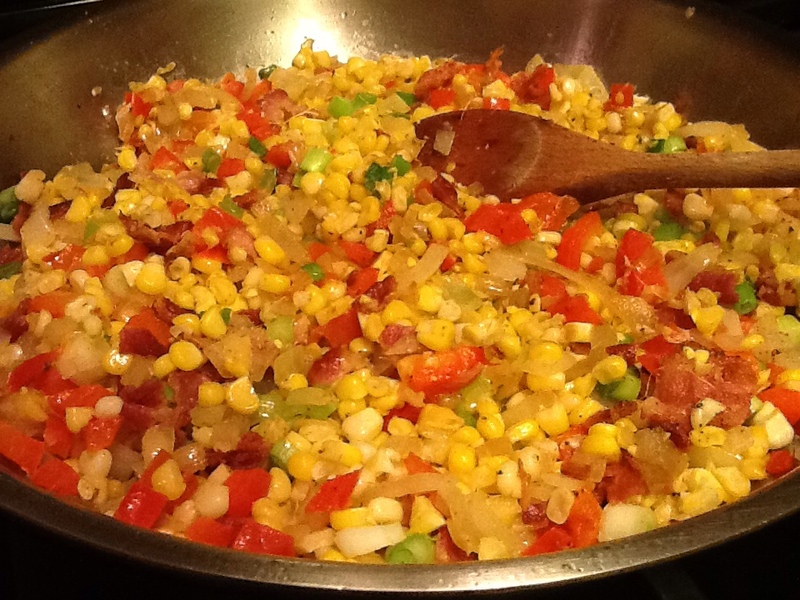 Oct18October 18, 2013 • By Betsy Karetnick • This entry was posted in Corn, Dish of the Day, Recipes and tagged bacon, corn, gluten-free. Bookmark the permalink. Sounds delicious. As I have a few chickens, I buy “fresh” corn year round for them as a treat. With this recipe they will have to share those kernels. Thanks. YUM – that sounds amazing Betsy. Can’t wait to try it. Thanks!